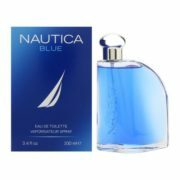 Nautica Blue by Nautica for Men Introduced in the year 2006 by the design house of Nautica. NAUTICA BLUE is classified as masculine fragrance. This masculine scent posesses a blend of: Peach, Pineapple, Jasmine, Cedar, Bergamot, Musk, Sandalwood, Water Lily.